PE Coach lets service people and veterans suffering from PTSD to assess symptoms, record therapy sessions, receive reminders and more. The military has released a new mobile app designed for post-traumatic stress disorder patients in a therapy known as prolonged exposure. PE Coach was developed by the Departments of Defense and Veterans Affairs and offers users a mobile way of assessing symptoms, recording therapy sessions, receiving reminders for homework and appointments and learning more about PTSD. The app is available on Apple and Android devices, but is advised for use only when a patient is receiving professional prolonged exposure therapy. That type of treatment focuses on "exposure practice," or approaching situations the patient has been avoiding because they seem unsafe or are related to the trauma that brought on PTSD. For veterans, this might include avoiding crowded public places or congested traffic. The treatment also involves revisiting the traumatic memory with a clinician in order to learn how to better handle the stressful feelings that it raises. Part of the therapy, Dr. Greg Reger, a clinical psychologist at DOD's National Center for Telehealth and Technology, told NBC News, is recording each therapy session and listening to it daily in order to overcome fear around those situations. Traditionally, Reger said, patients would leave an appointment with CD recordings and several sheets of paper to help complete daily homework assignments that include confronting an anxiety-inducing scenario. "Our patients don’t avoid (homework assignments) because they don’t want to get better," Reger said, "but any inconvenience provides an excuse not to do something even if it helps you get better." Patients, for example, might find it difficult to listen to the recording if the only CD player available to them is in a car. They might also feel self-conscious about taking notes in public after going into a crowded mall or driving through rush hour traffic, but PE Coach allows a patient to type descriptions directly into the phone. The app, Reger said, is a "dramatic shift" in how convenient it is to stick to daily therapy. Since a quiet pre-release in March, the app has been downloaded more than 2,000 times. 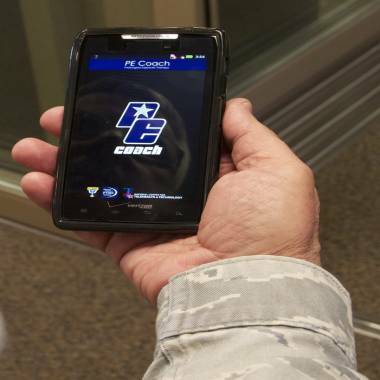 A separate DOD and VA app called PTSD Coach, which was designed for wide use, has been downloaded more than 66,000 times since last year. Reger said the app would be used by many VA and DOD mental health clinicians who are trained in prolonged exposure therapy. The ability of the app to capture the homework data, even time-stamping when a patient listened to the therapy recordings, helps clinicians monitor the success of the treatment in ways he or she couldn't do before, Reger said. "We want to celebrate the response they’ve had because of their hard work." Rebecca Ruiz is a reporter at NBC News and a 2011-2012 Rosalynn Carter Mental Health Journalism Fellow. Follow her on Twitter here.